This is great post workout/gym snack! Begin by pre-heating a pan containing 1 tbsp olive oil or coconut oil. If you’re making your salsa then add your ‘salsa’ ingredients into a bowl and mix together. Cover and leave in the fridge whilst you prep your wrap filling. In a mixing bowl, whisk together the eggs, milk, salt, pepper and onion. Heat another pan up over a medium heat with a tsp of olive oil and pour the egg mixture into the pan and stir continuously until the eggs are just cooked (the eggs will continue to cook when off heat so be sure not to overcook them!). Pour the scramble into a bowl and set aside. Using the same pan for the eggs, fry your bacon until just cooked – flipping half way through. 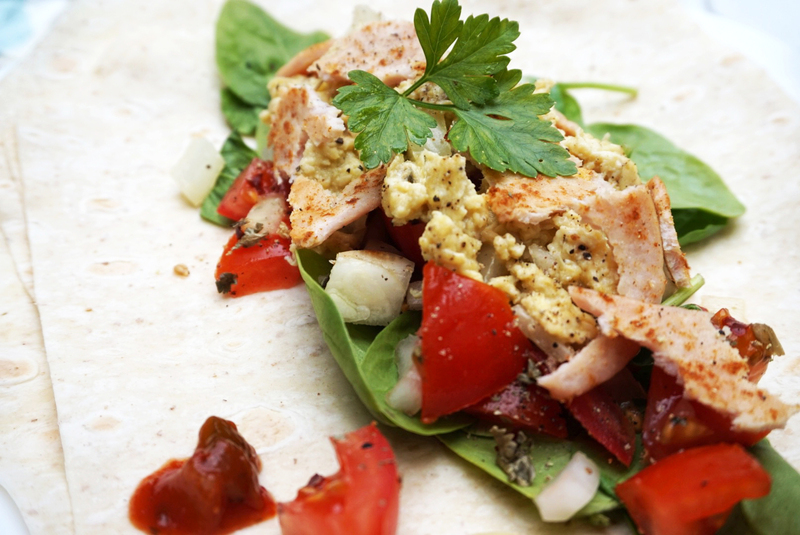 Grab your two wraps and layer both of them with the spinach first, tomato salsa next and then finish with turkey bacon. I also like to add another sprinkle of pepper here. Wrap them up and cover them in foil (if you want them heated) and pop them in the oven for 10 minutes. Take the wraps out of the oven, remove the foil from the top and enjoy whilst they’re warm!